Another website for tracking your Final Fantasy XIV Triple Triad card collection. Why would you make another one of these? I don't know, I just have a habit of remaking things that already exist. Easy setup: Create and maintain your card collection by matching up the website with your in-game card list. Quick updates: As much info as possible is pulled from the game data thanks to Saint Coinach. Community: If you have any feedback or feature requests, I want to hear them! All of the data used on this site is available for any savvy developers through a public RESTful JSON API. You can check out the full documentation here. Ser Aymeric now provides Triple Triad commands using our API. 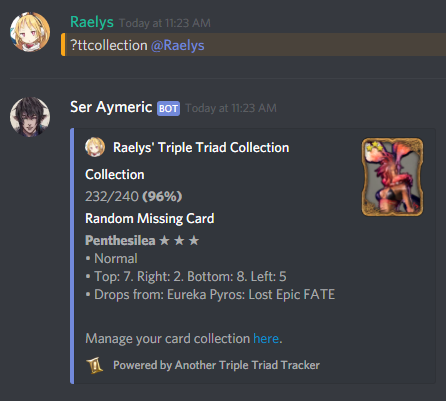 You can use the ttcollection command to show off your card collection or check out your friends' collections. Look up full card information by name with the ttcard command, or use ttnpcs to find NPCs by location.